We used the same rating scale for the chocolate milks as we did for the regular milks. Taste was rated on a scale of 1-5 with 1 being the lowest and 5 being great tasting. There was also room for comments. We mixed both chocolate milks into a small amount of warm water, then added cold water to make the total volume we were mixing. Honeyville’ Chocolate Milk Alternative scored an average of 3.93 with a range of 2-5. The most common score given was 5. If you are expecting Ovaltine (which I personally prefer over Quick) or the heavenly chocolate milk from the BYU creamery, this isn’t it. Yes, we had children who didn’t like this chocolate milk–I’m guessing they were expecting it to taste like the chocolate milk they have at home. Overall though, it had a very good chocolate flavor. It was a little “thinner” than regular chocolate milk and needed re-mixed after sitting overnight. Some thought the flavor was too strong and/or it was too sweet. You could use less mix to dilute the flavor, but it would also dilute the creaminess of the drink. One gal who works at the local restaurant said it reminded her of the chocolate ice cream mix for the soft serve machine before it’s frozen. The Morning Moos chocolate drink was a little lighter in color when it was mixed up than the Honeyville drink. It looked a little more like regular chocolate milk. The flavor was good, but the texture still wasn’t like chocolate milk. It scored an average of 3.43 on the taste score, with a range of 1-5 and the most common score split between 3 and 5. This variety also needed re-mixing after sitting, and some of the kids didn’t like it either, although mine had no problem drinking either of the chocolate milks. We had some comments that it was very good and some that it was too sweet. We actually found the way we liked either of these chocolate milk drinks best at our house was to mix half chocolate drink and half milk together. Even a powdered milk worked. It dulled the sweetness a little bit and added “milk” flavor and texture to it. Mixed half and half like that made it taste more like drinking the chocolate milks that are mixed into milk. I didn't know there was such a thing so I appreciate knowing this! Thank you for all the research and information you provide. Thanks. 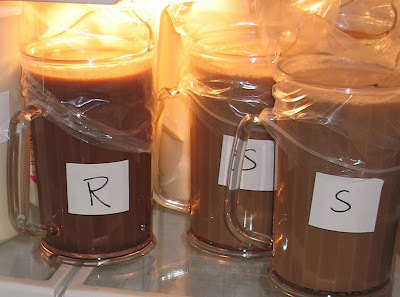 Would be nice to have some chocolate milk for food storage and tip of mixing it sounds like a plan! Thanks girl…I've been planning on getting some of this mix…but was sorta torn on which one to get! You may have helped to answer that for me! We drink Morning moo MOST of the time unless milk is cheaper by the gallon fresh than the Moo. Lately Costco is a great place to buy Moo. My kids enjoy both the white and chocolate. No complaints.